Remember my Panaplex clock project? Here’s a present: the design details! Wow, it’s been a few months since my last post. Sorry for the blog silence. I got very busy with a new job and just haven’t had the time to work on projects at all, let alone blog! 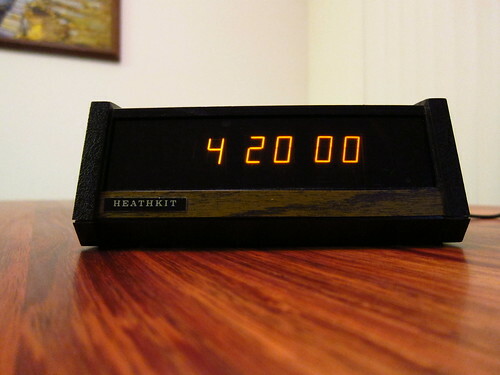 So here’s a quick one–it’s a Heathkit GC-1005 digital clock that uses Panaplex displays (Neon filled). I picked it up at the electronics flea market and it looked like someone had been trying to get it working before me, and they left a bit of a mess. I had to clean up the wiring job and check the electrolytics to make sure they were still good (they were). The reason it wasn’t working right is that some of the component leads on the bottom of the PC board had poked through a paper insulator and shorted out against the switch contacts on the bottom of the case. All I had to do was trim the component leads and fix the insulator.